IKEA Kallax shelves are a stylish and versatile storage solution that offer more visual interest than classic bookshelves thanks to their square interior spaces. They come in a variety of sizes and configurations that you can put together as a modular solution to fit any space. Best of all, IKEA has a whole range of boxes, baskets, and drawers designed to fit in those squares, so you can make your Kallax shelves as unique as you are. Check out our favorite ways to use Kallax below. We love Kallax as a chic room divider. A recent upgrade of the discontinued Expedit shelves, Kallax now features rounded edges that are easier on shins, so go ahead and use them in high-traffic areas. We love the way the divider in the photo above is positioned to let the the sun shine into the seating area from the window. When using Kallax as a room divider, you’re free to fill all those square spaces with great decorative items. Even books become a part of the decor when arranged by color, and you can add as many as you like to have an opaque surface or one that allows a bit of a view to the other side. Eclectic Family Room by Greensboro Kitchen & Bath Remodelers Interior Design Solutions by Maria, Inc. The modular nature of Kallax is at its best when pieced together for a custom entertainment center. Sure, a painting is at the heart of these shelves, but you could just as easily mount a flat-screen TV in that location or place an older model television set on the sturdy shelf between the tall ones. 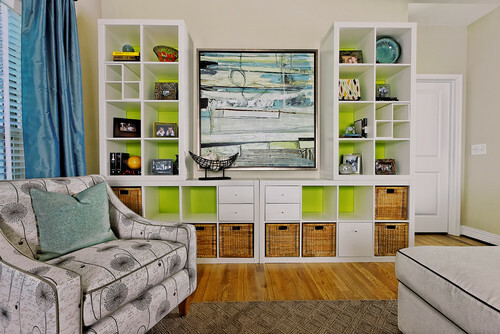 There’s an endless range of baskets and drawers to hide your Wii remotes and DVD collection. Bonus points for painting the back of the shelves a bold, contrasting color. Turn those tall units on their sides to make a cozy window seat. You can create the look of built-ins without the high price of custom carpentry. Add some cozy cushions for a cozy spot in a kids’ room or a comfortable reading nook in a corner of the family room. 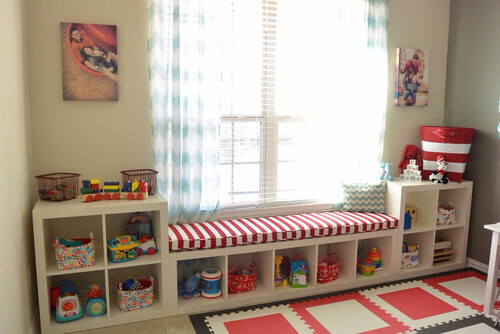 As an alternative to toy storage that’s low to the ground, mount a long Kallax shelf at eye level for useful wall cubbies. This is a great look for a mud room or foyer, especially when paired with coat hooks and a bench or two.